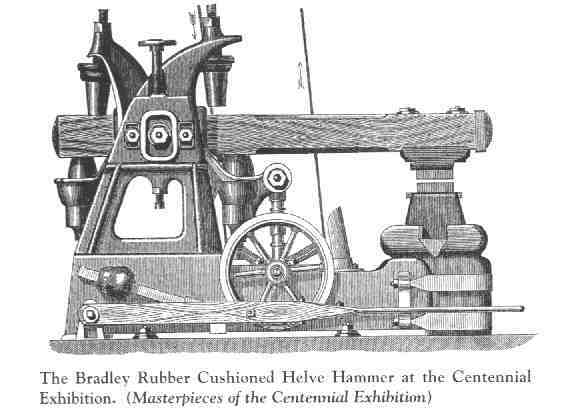 An historical treatise on the development of the mechanical power hammer. Includes the history of the major manufacturers, hundreds of illustrations including patent drawings, advertising engravings and photographs. The author delves into some of the most peculiar hammer mechanisms including what are called "atmospheric" hammers. Atmospheric hammers use an air cylinder coupled to the common crank linkage, the cylinder providing the variable length linkage and cushioning. 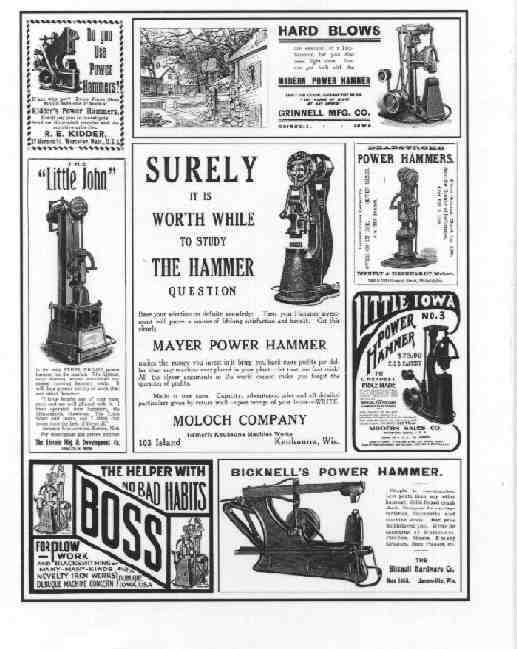 One of the interesting things I learned from this book is that Moloch, who's hammers I knew looked like Little Giants, owned or merged with Meyer Brothers, designers of the Little Giant, for a time (No wonder they looked alike!). I have seen or read about almost all the hammer's in Freund's book. However, it has taken a life time of interest in old machinery. Here it all is, in one exceptional book. 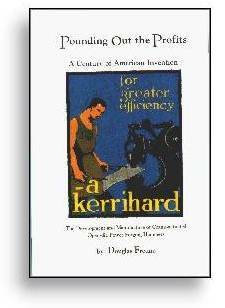 Note: This IS an historical reference and excellent source material for designers and historians, however it is NOT a "how to" book and offers no information on power hammer technique (for that see, The Forging Industry Handbook). The following illustrations are examples of the superb illustrations throughout the text. "Excellent Book! Shows lots of mechanisms and hundreds of hammers!!!!!!!!! A MUST for any blacksmith, at a great price". Available from the author: Tell them you saw it in anvilfire.com!